I love nachos. The crunch of the chips, combined with the flavors of the toppings, a bit of spiciness and the creaminess of the cheese…yum. 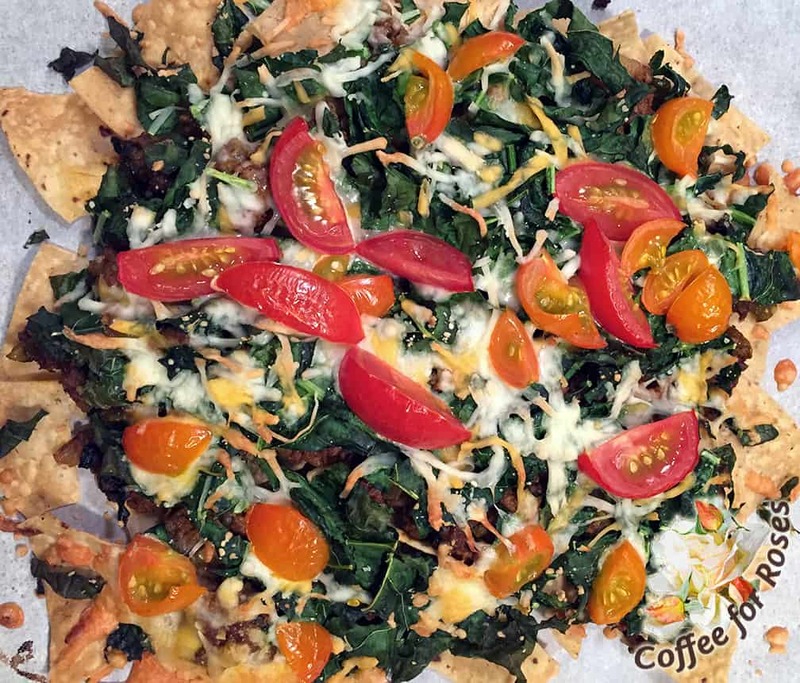 But at this time of year when the garden is producing such wonderful, flavorful vegetables, is it possible, I wondered, to combine my first-class veggies in a classic nacho plate? Go into the garden and ask “What’s for dinner?” In other words, pick what’s ripe right now. I harvested summer squash, peppers (bell and spicy), carrots, green beans, kale and chard. I also picked some chives, basil and cilantro. Chop fine or grate the veggies you’ve picked and sauté them in a small amount of oil until they’re tender. Add the herbs you’ve harvested, also chopped fine. Season with chili powder, smoked paprika and cumin to taste. Add two or more tablespoons of your favorite barbeque sauce and toss to blend flavors. Line a cookie sheet with baking parchment and put down a layer of tortilla chips so that their edges touch. Spoon the mixed veggies over the chips. Top with shredded Kale or Chard if desired, and cover that with the grated mixed Mexican cheeses. Add some chopped cherry tomatoes and place in a 375 degree oven for ten to fifteen minutes or until the greens wilt and the cheese starts to melt and brown. Serve with your favorite hot sauce, guacamole or finely chopped avocado. Once you eat your own vegetable nacos you’ll never order them in a restaurant again!